Click for more tournament pictures. 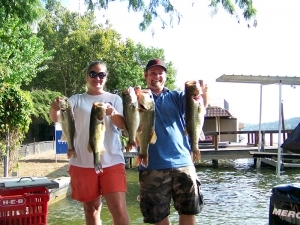 Lake Austin Tournament – Leslie and Brent take the win on Lake Austin, but just by the hair of their chinny chin chins! Brent and Leslie win by one tenth of a pound, just edging out the Lake Austin legends Brenda and Cliff Davis. Brian Burns weighs in a hefty 8.96 bass to take the current men’s big bass of the year honors away from Jerry Gold. Brian’s fish was obviously the men’s big bass of this tournament and Brenda Davis weighed a nice 6.45 pounder to take women’s big bass spot of the tournament. It was good to fish with our new couple Kristi and James White. We hope you guys had fun! 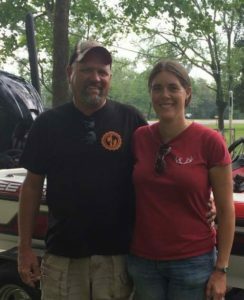 Melissa and Robby Beathge fished their second tournament since joining MMBC, we hope to fish with you guys many more times in the future!